The MacBook Air is still an amazing device. The first Apple laptop to feature an ultra-thin profile, the Air is also Apple's most affordable laptop. Today we have a deal for all of you MacBook Air users: a 4-port USB Hub MacBook Air Stand for just $31.99. The stand has four USB ports for keeping all of your favorite accessories charged and also serves a very important purpose. By raising the back of your MacBook Air by about an inch, the stand not only provides air space for cooling your little laptop, but also pops the device up to an 18° viewing angle. 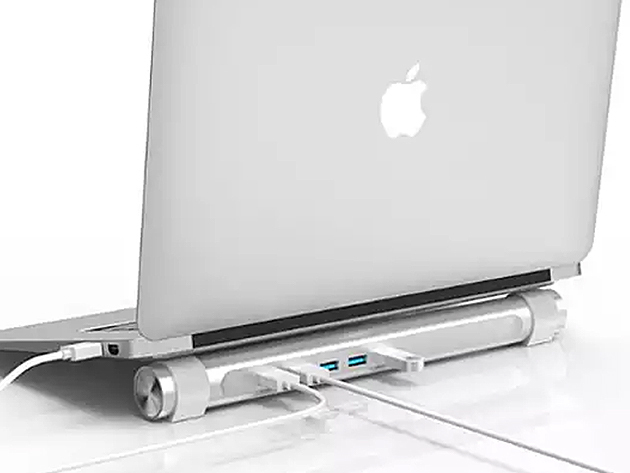 A 3-foot long data cable is included for connecting the 4-port USB Hub MacBook Air Stand to your laptop. The stand normally sells for $97, so we've managed to slash 67% off the retail price. This deal doesn't last forever, so visit the Apple World Today Deals Shop right now to pick one up!